So our youngest blessing has had the nickname “monster baby” for quite some time…..now she is a monster toddler, LOL! So for Halloween last year I wanted to capture the theme of her personality….monster! Don't worry…we love her anyway! 😆 I decided that a Cookie Monster Costume would be cute and since she also has a sweet tooth it was really appropriate! 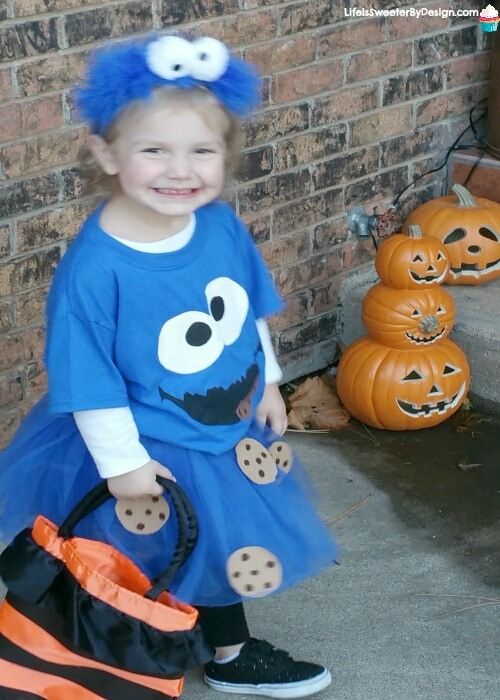 A cookie monster costume isn't hard to do at home with a little hot glue and creativity!! 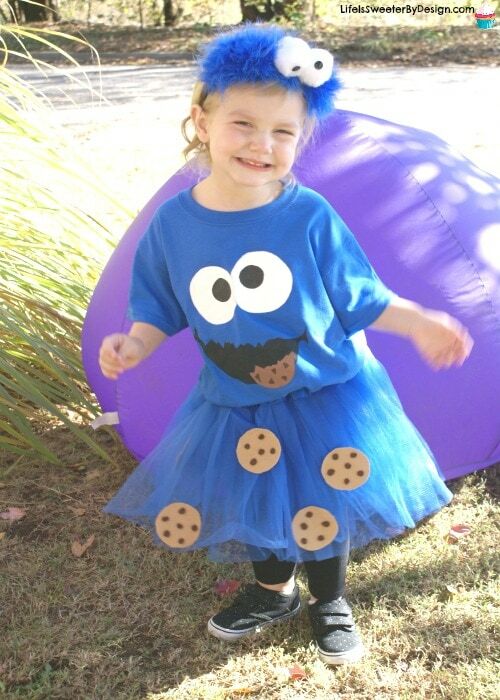 Keep reading to find out how to make a Cookie Monster Costume at home for your little monster! So I don't have the patience or desire to make tutu's and they are fairly cheap to buy. I just went to Amazon and found an inexpensive royal blue tutu and ordered it. I think it was cheaper than if I had gone and bought the tulle and made the tutu myself!! I do love the look of tutu's for little girl's costumes though and I really wanted E's costume to have a tutu with it!! Once I got the tutu in the mail I made some cookies! This was as simple as taking some light brown or tan felt and cutting out some circles. 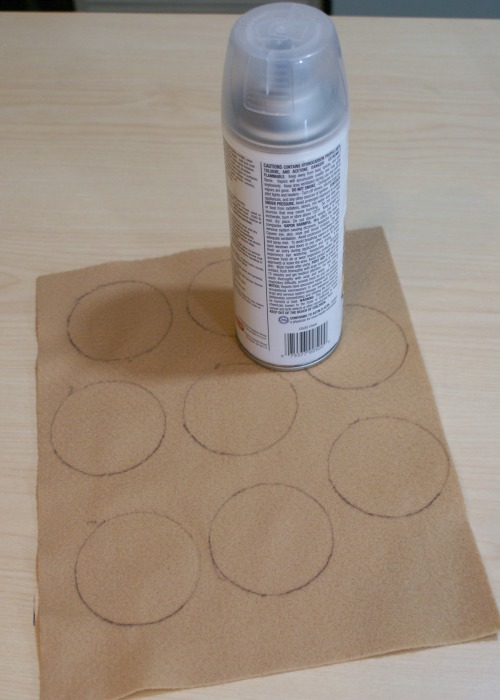 I used a spray can to trace my circles because it seemed like just the right size circle. Then I took some dark brown felt and cut out tiny circles to make the chocolate chips. 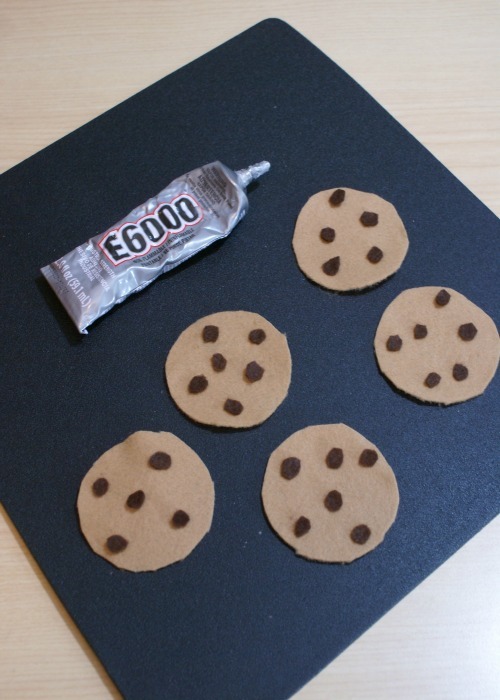 I glued the chocolate chips to the felt cookie with some liquid adhesive E6000. Then I glued the cookies randomly onto the front of the tutu. One thing to remember is to put a piece of cardboard or cardstock…something under the first layer of tulle before you glue the cookies onto the skirt. This will keep all the layers from sticking together and looking funky! My grumpy little one is picky when it comes to itchy clothes. So I wanted her shirt to be comfy. 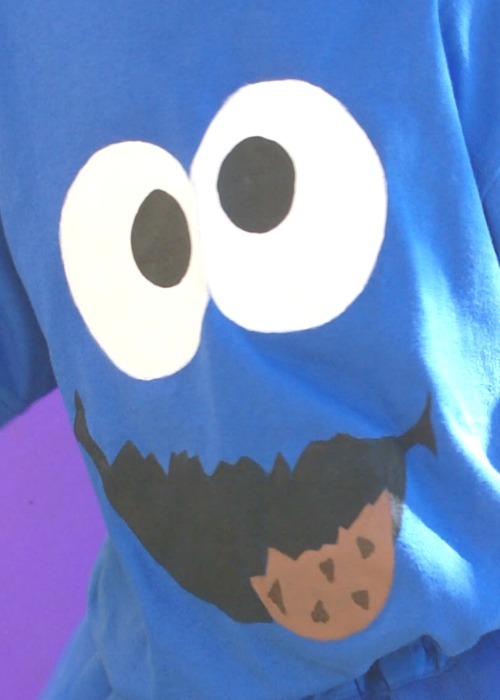 I just bought a plain royal blue t-shirt for the cookie monster costume. I am blessed to have a very talented and crafty mother who can free hand paint! I told her I needed a cookie monster face on the shirt and she painted it with no problem. It turned out PERFECT!!! Obviously, not everyone is as talented as she is in the painting department. If you don't have the ability or have a friend who can paint the face on the shirt….you can always order a custom shirt off of Etsy. You could have them do an embroidered cookie monster face and that would be cute too! So my daughter doesn't have a ton of hair still and I decided a headband was the way to go. 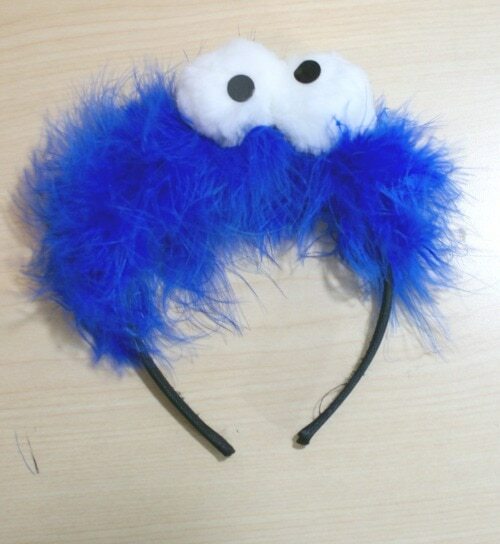 I made the cookie monster costume headband myself and was happy with the results. I dug around in our hair accessories drawer and found an old black headband. I bought some marabou at the craft store. Then I bought some big white pom poms. I cute out tiny black circles out of felt for the eye balls. I used my trusty hot glue gun and glued the marabou onto the headband. Then I hot glued the pompoms onto the headband close together like cookie monster's eyes are. Last I glued the black felt eyeballs onto the white pompoms. I put the eyeballs at a funny angle just like the real cookie monster! I loved the way this costume turned out and my daughter loved it too!! I just put some black pants underneath the tutu so it didn't itch her. Plus it gets chilly in the evening for trick or treating time. I added some black shoes and she was set. This was a fast and simple costume to make at home and it was a hit!! 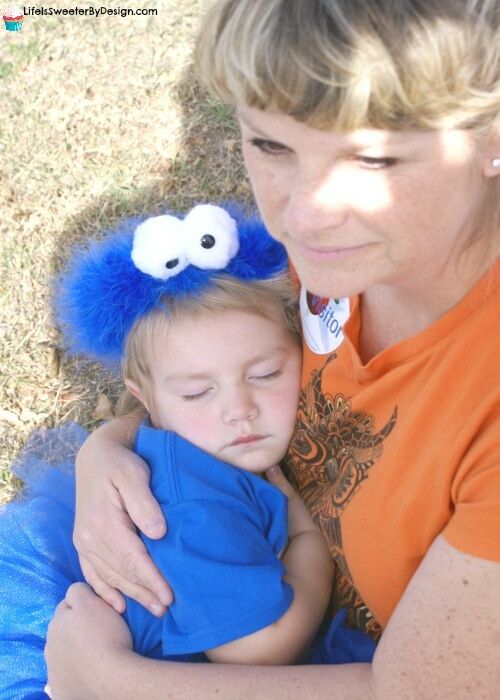 Now that you know how to make a Cookie Monster Costume at home….who will be wearing it? What are your favorite costumes to make at home? Be sure to check out another one of my favorites….the year my older daughter was Cindy Lou Who!! I also have a lot of costume ideas for SISTERS…because I have 3 girls! !